Guest post by Grace Taylor. When you’re in a rush to get your website up and running, it can be tempting to consider free web hosting as a shortcut. There may be no shortage of free good hosting providers to choose from. But if you’re serious about launching your online business or blog, opting for a free web hosting plan may not be the best idea. Going for the free web hosting option is similar to playing in the children’s sandpit in a playground. Sure, you can move things around and pretend you’re having a good time. But you’ll never get to do what the big kids are doing when you’re stuck in that sandpit. While this analogy sums it up well, here are 7 specific reasons why good hosting should not be free for anyone who actually wants to succeed online. The most noticeable problem with free hosting is the slower page loading times and delays that are a result of your site operating on a shared server. Even for a non-busy site, if the server partition can’t cope, your visitors may have to deal with downtime and errors. Even in an ideal scenario, sites using free web hosting will almost always load slower than those backed by a comprehensive VPS or dedicated plan from an alternative good hosting option. The advent of high-speed connections has shortened the patience (and possibly the attention spans) of web users, so a slow loading site can really be a deal breaker nowadays. Most sites that use free hosting pans are run by novices. This means in the majority of cases these people won’t notice any traffic limitations. Probably because their site isn’t really getting much traffic to begin with. However, if your site does receive a legitimate visitor boost, the a free hosting plan will cause the pages to load very slowly or even fail to load altogether. This is due to the inherent bandwidth restrictions that come with all free hosting solutions. Conversely, a good hosting plan ensures that your site is capable of accommodating as much traffic as you can reasonably attract. And a paid plan can be quickly expanded and upgraded should additional bandwidth be needed. Free hosting plans always limit the amount of storage space for your web files and media. This means that eventually you’d either have to delete some content or upgrade to a paid solution. It also means that you won’t have the freedom to download and install files on the web server. Although all good hosting plans have their own terms and conditions, free plans understandably have the most restrictive server storage policies. The administrative interface in a free hosting control panel is typically lacking in comparison to that of a paid hosting platform. A premium good hosting plan will include full access to a robust control panel like cPanel or Plesk, along with a range of pre-installed modules that can help you better build and manage your site. There isn’t the freedom to install new modules or implement custom scripts in a free hosting option as you would get from a paid hosting plan’s control panel. If you’re looking for responsive and accountable support, you won’t necessarily get this from a free hosting plan. 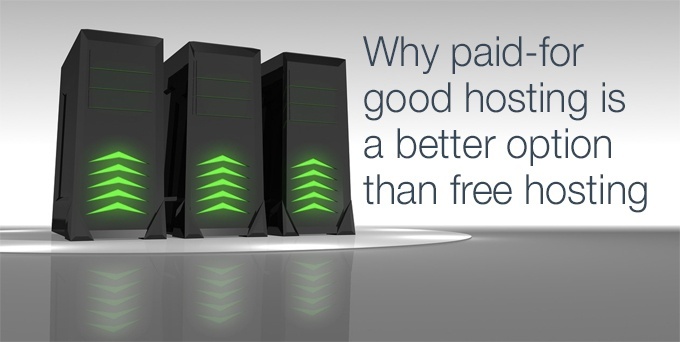 A good hosting that is paid for can offer a much better customer service. These web hosts give higher priority to their paying customers, so you really do get what you pay for. This is important when you’re constructing or maintaining a site and need help solving a problem quickly. Easy access to support services via email, phone, and chat becomes a top concern. People who use free hosting plans may have to wait hours or sometimes days for responses to their help tickets. Compare that to being aided in real-time by a premium provider and there really is no comparison. This is important if you want to effectively brand your site. A mere subdomain like that just won’t cut it. However, a paid good hosting plan will use your own domain, so you will have full branding control over the entire website. Plus, having your own domain also comes with SEO perks, because you can build the domain’s authority from within your niche. Another reason is savvier visitors will be able to tell that you’re not using a paid hosting plan, which is certainly less than ideal. You want to avoid giving the impression to prospective customers, partners and investors that you’re operating on a shoestring budget. Your visitors need to think that you spared no expense when building your brand. Such an impression will lead to greater perceived trust. Projecting professionalism is a fundamental step every new online business should take to make itself a formidable competitor in any industry. Therefore, it really makes no sense to skimp on the cost of good hosting when you consider it’s already so cheap. Especially if using a reputable web hosting provider such as HostPresto.com. Even paying more for a powerhouse hosting package is still a relatively nominal investment. Certainly when you consider all of the above shortcomings of free web hosting. If you are serious about growing your online business, you should not even consider a free hosting plan. The sooner you realise this and act accordingly, the sooner you’ll have a bustling, well-received and high-ranking website.